Farrar, Straus and Giroux, 9780374120702, 400pp. Baraka, Al, Teddy, and Sayyid—four black men from South Philadelphia, two Christian and two Muslim—are serving life sentences at Pennsylvania's maximum-security Graterford Prison. All of them work in Graterford's chapel, a place that is at once a sanctuary for religious contemplation and an arena for disputing the workings of God and man. Day in, day out, everything is, in its twisted way, rather ordinary. And then one of them disappears. Down in the Chapel tells the story of one week at Graterford Prison. We learn how the men at Graterford pass their time, care for themselves, and commune with their makers. We observe a variety of Muslims, Protestants, Catholics, and others, at prayer and in study and song. And we listen in as an interloping scholar of religion tries to make sense of it all. When prisoners turn to God, they are often scorned as con artists who fake their piety, or pitied as wretches who cling to faith because faith is all they have left. 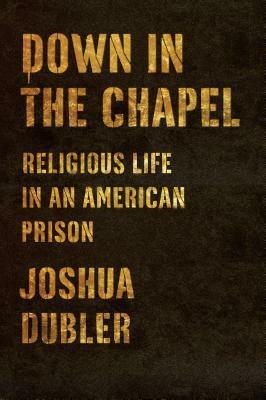 Joshua Dubler goes beyond these stereotypes to show the religious life of a prison in all its complexity. One part prison procedural, one part philosophical investigation, Down in the Chapel explores the many uses prisoners make of their religions and weighs the circumstances that make these uses possible. Gritty and visceral, meditative and searching, it is an essential study of American religion in the age of mass incarceration. Joshua Dubler is an assistant professor of religion at the University of Rochester, the coauthor of Bang! Thud: World Spirit from a Texas School Book Depository, and the author of Down in the Chapel: Religious Life in an American Prison (FSG). He has also taught at Haverford College, Columbia University, and Villanova’s University’s Program at Graterford Prison.